CCopasiNode class. The class CCopasiNode is describes a node of the CCopasiTree. Created for COPASI by Stefan Hoops 2003 The class CCopasiNode is the interface used by the template class CCopasiTree< class Node> to manage the nodes of a tree. Actual implementation of nodes must be derived from CCopasiNode for the tree to operate properly. Definition at line 39 of file CCopasiNode.h. Definition at line 42 of file CCopasiNode.h. Definition at line 73 of file CCopasiNode.h. Definition at line 84 of file CCopasiNode.h. Definition at line 96 of file CCopasiNode.h. Destructor. Note: Within a tree the parent of this node has to be corrected. Definition at line 107 of file CCopasiNode.h. Add a child to a node. If pAfter == this the child will be inserted at the front of the list of children. Reimplemented in CEvaluationNodeCall, and CEvaluationNodeVector. Definition at line 156 of file CCopasiNode.h. 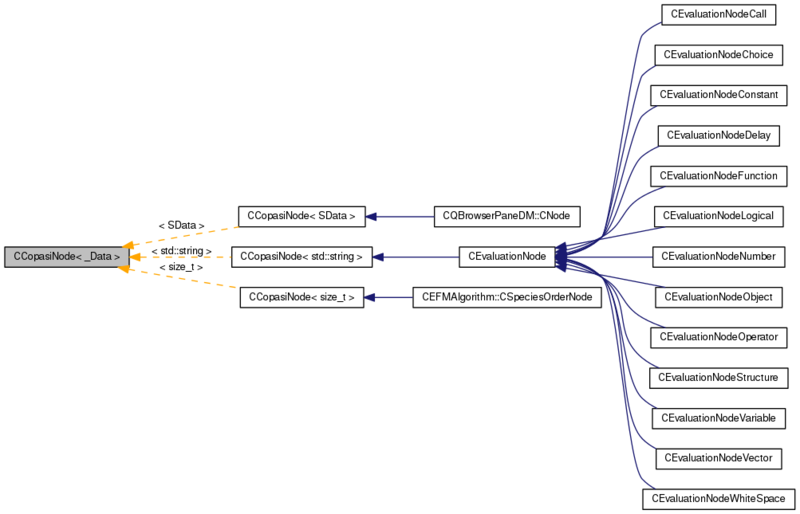 Referenced by CEvaluationNodeVector::addChild(), CEvaluationNodeCall::addChild(), CCellDesignerImporter::addDependency(), CODEExporter::assembleSubTreeForMassAction(), CEvaluationNodeNormalizer::buildOperatorBranchFromChain(), CMathExpression::CMathExpression(), CQBrowserPaneDM::CNode::CNode(), CEvaluationNodeNormalizer::collectIdenticalBranches(), CMathEventN::CTrigger::CRoot::compile(), CMathEventN::CTrigger::compileAND(), CMathTrigger::compileAND(), CMathEventN::CTrigger::compileEQ(), CMathTrigger::compileEQ(), CMathTrigger::compileGE(), CMathTrigger::compileGT(), CMathEventN::CTrigger::compileLE(), CMathTrigger::compileLE(), CMathTrigger::compileLT(), CMathEventN::CTrigger::compileNE(), CMathTrigger::compileNE(), CMathEventN::CTrigger::compileNOT(), CMathTrigger::compileNOT(), CMathTrigger::compileOR(), CMathTrigger::compileXOR(), convertToCEvaluationNode(), CEvaluationNode::copyNode(), CNormalTranslation::createChain(), createItemPower(), createLogical(), CSBMLExporter::createMassActionExpression(), CMathExpression::createMassActionPart(), CNormalTranslation::createOperatorChain(), createProduct(), CDerive::deriveBranch(), SBMLImporter::divideByObject(), CNormalTranslation::elementaryElimination(), CNormalTranslation::elementaryEliminationMinus(), CNormalTranslation::eliminateDirectlyNestedFractions(), CNormalTranslation::eliminateNestedPowers(), CNormalTranslation::eliminatePowersOfFractions(), expand_function_calls(), CNormalTranslation::expandPowerBases(), CNormalTranslation::expandPowerExponents(), CNormalTranslation::expandPowerNodes(), CNormalTranslation::expandProducts(), CODEExporter::exportSingleFunction(), CNormalTranslation::factorize(), CEvaluationNodeNumber::fromAST(), CEvaluationNodeDelay::fromAST(), CEvaluationNodeChoice::fromAST(), CEvaluationNodeOperator::fromAST(), CEvaluationNodeLogical::fromAST(), CEvaluationNodeFunction::fromAST(), CMathTrigger::CRootFinder::getTrueExpression(), CNormalTranslation::matchPowerBases(), CNormalTranslation::matchSummands(), CODEExporter::modifyTreeForMassAction(), CNormalTranslation::multiply(), CSBMLExporter::multiplyByObject(), CNormalTranslation::newCancel(), CNormalTranslation::newEvaluateNumbers(), CEvaluationNodeNormalizer::normalizeCEvaluationNodeChoice(), CEvaluationNodeNormalizer::normalizeCEvaluationNodeDelay(), CEvaluationNodeNormalizer::normalizeCEvaluationNodeFunction(), CEvaluationNodeNormalizer::normalizeCEvaluationNodeLogical(), CEvaluationNodeNormalizer::normalizeDivideNode(), CEvaluationNodeNormalizer::normalizeMinusNode(), CEvaluationNodeNormalizer::normalizeModulusNode(), CEvaluationNodeNormalizer::normalizeMultiplyNode(), CEvaluationNodeNormalizer::normalizePlusNode(), CEvaluationNodeNormalizer::normalizePowerNode(), CNormalTranslation::product2fraction(), replace_variable_names(), CSBMLExporter::replaceSpeciesReferences(), CEvaluationNodeOperator::simplifyNode(), CEvaluationNodeFunction::simplifyNode(), CNormalTranslation::splitSum(), CNormalTranslation::swapNegativeNumbers(), CEvaluationNodeDelay::toAST(), CEvaluationNodeCall::toAST(), CEvaluationNodeOperator::toAST(), CEvaluationNodeLogical::toAST(), CEvaluationNodeFunction::toAST(), SBMLImporter::variables2objects(), and CReaction::variables2objects(). 159 if (!pChild) return false; // Nothing to insert. Add a sibling to a node. If pAfter == this the sibling will be inserted at the front of the list of siblings. Definition at line 286 of file CCopasiNode.h. Referenced by CCopasiNode< size_t >::addSibling(). 289 if (!pSibling) return false; // Nothing to insert. 307 return false; // Insertion point no found. Definition at line 199 of file CCopasiNode.h. Referenced by CQBrowserPaneDM::clear(), and CCopasiNode< size_t >::~CCopasiNode(). Retrieve the child of a node. Definition at line 210 of file CCopasiNode.h. Referenced by CCellDesignerImporter::addDependency(), SBMLImporter::areEqualSubtrees(), CEvaluationNodeDepthFirstIterator::CEvaluationNodeDepthFirstIterator(), CSBMLExporter::checkForPiecewiseFunctions(), CSBMLExporter::checkForUnsupportedFunctionCalls(), CMathTrigger::compileAND(), CMathEventN::CTrigger::compileEQ(), CMathTrigger::compileEQ(), CMathTrigger::compileFUNCTION(), CMathTrigger::compileGE(), CMathTrigger::compileGT(), CMathTrigger::compileLE(), CMathTrigger::compileLT(), CMathTrigger::compileNE(), CMathTrigger::compileNOT(), CMathTrigger::compileOR(), CDerive::compileTree(), CMathTrigger::compileXOR(), convertToCEvaluationNode(), CMathEventN::CTrigger::countRootsEQ(), createCall(), createChoice(), SBMLImporter::createCReactionFromReaction(), CMathContainer::createDiscontinuityTriggerInfix(), createFunction(), createGeneralPower(), createItemPower(), createItemPowerItem(), createLogical(), createLogicalChoice(), createLogicalItem(), CEvaluationNodeOperator::createModuloTree(), SBMLImporter::divideByObject(), SBMLImporter::doMapping(), CNormalTranslation::elementaryElimination(), CNormalTranslation::elementaryEliminationDivide(), CNormalTranslation::elementaryEliminationFunction(), CNormalTranslation::elementaryEliminationMinus(), CNormalTranslation::elementaryEliminationModulus(), CNormalTranslation::elementaryEliminationMultiply(), CNormalTranslation::elementaryEliminationPlus(), CNormalTranslation::elementaryEliminationPower(), CNormalTranslation::eliminateDirectlyNestedFractions(), CNormalTranslation::eliminateNestedPowers(), CNormalTranslation::eliminatePowersOfFractions(), expand_function_call(), expand_function_calls(), CNormalTranslation::expandPowerBases(), CNormalTranslation::expandPowerExponents(), CNormalTranslation::expandPowerNodes(), CNormalTranslation::expandProducts(), CEvaluationNodeNormalizer::findChainNodes(), CSBMLExporter::findDirectlyUsedFunctions(), CSBMLExporter::findModelEntityDependencies(), CNormalTranslation::findNegativeNumbers(), CNormalTranslation::findSummands(), CEvaluationNode::findTopMinus(), CCopasiNode< size_t >::getChild(), CEvaluationNodeFunction::getMMLString(), CCopasiNode< size_t >::getNumChildren(), CQBrowserPaneDM::CNode::getRow(), CQBrowserPaneDM::index(), SBMLImporter::isConstantFlux(), isLogical(), SBMLImporter::isMassAction(), SBMLImporter::isMassActionExpression(), SBMLImporter::isSimpleFunctionCall(), CNormalTranslation::matchPowerBases(), CNormalTranslation::matchSummands(), CSBMLExporter::multiplyByObject(), CNormalTranslation::newCancel(), CNormalTranslation::newEvaluateNumbers(), CEvaluationNodeNormalizer::normalizeCEvaluationNodeCall(), CEvaluationNodeNormalizer::normalizeCEvaluationNodeChoice(), CEvaluationNodeNormalizer::normalizeCEvaluationNodeDelay(), CEvaluationNodeNormalizer::normalizeCEvaluationNodeFunction(), CEvaluationNodeNormalizer::normalizeCEvaluationNodeLogical(), CEvaluationNodeNormalizer::normalizeDivideNode(), CEvaluationNodeNormalizer::normalizeMinusNode(), CEvaluationNodeNormalizer::normalizeModulusNode(), CEvaluationNodeNormalizer::normalizeMultiplyNode(), CEvaluationNodeNormalizer::normalizePlusNode(), CEvaluationNodeNormalizer::normalizePowerNode(), CEvaluationNodeDepthFirstIterator::operator++(), CEvaluationNode::operator<(), CNormalTranslation::order(), CNormalTranslation::printPointers(), CNormalTranslation::product2fraction(), CQBrowserPaneDM::removeRows(), SBMLImporter::renameMassActionParameters(), replace_variable_names(), CSBMLExporter::replaceSpeciesReferences(), SBMLImporter::separateProductArguments(), SBMLImporter::setCorrectUsage(), CSBMLExporter::setFunctionSBMLIds(), CEvaluationNodeOperator::simplifyNode(), CNormalTranslation::simplifyTree(), CNormalTranslation::splitProduct(), CNormalTranslation::splitSum(), CNormalTranslation::swapNegativeNumbers(), test000053::test1_bug1000(), test000053::test3_bug1000(), test000053::test5_bug1000(), test000093::test_bug1503_1(), test000093::test_bug1503_2(), test000052::test_bug988(), test_compare_utilities::test_copasi_function_expansion(), test000047::test_delay(), test000091::test_delay_in_kinetic_law(), test000091::test_delay_in_kinetic_law_local_parameter(), test000040::test_hasOnlySubstanceUnits(), test000023::test_hasOnlySubstanceUnits(), test000042::test_hasOnlySubstanceUnits(), test000043::test_hasOnlySubstanceUnits(), test000025::test_hasOnlySubstanceUnits(), test000033::test_hasOnlySubstanceUnits(), test000026::test_hasOnlySubstanceUnits(), test000082::test_import_delayAssignment_1(), test000082::test_import_delayAssignment_2(), test000082::test_import_delayAssignment_3(), test000082::test_import_delayAssignment_4(), test000082::test_import_delayAssignment_5(), test000082::test_import_delayAssignment_6(), test000082::test_import_delayAssignment_7(), test000082::test_import_delayAssignment_8(), test000064::test_import_event_assignment_expression_and_hasOnlySubstanceUnits_1(), test000064::test_import_event_assignment_expression_and_hasOnlySubstanceUnits_2(), test000064::test_import_event_assignment_expression_and_hasOnlySubstanceUnits_3(), test000064::test_import_event_assignment_expression_and_hasOnlySubstanceUnits_4(), test000064::test_import_event_assignment_expression_and_hasOnlySubstanceUnits_5(), test000064::test_import_event_assignment_expression_and_hasOnlySubstanceUnits_6(), test000064::test_import_event_assignment_expression_and_hasOnlySubstanceUnits_7(), test000064::test_import_event_assignment_expression_and_hasOnlySubstanceUnits_8(), test000095::test_import_l3_event_1(), test000095::test_import_l3_event_2(), test000095::test_import_l3_event_3(), test000095::test_import_l3_event_4(), test000095::test_import_l3_event_5(), test000065::test_import_reaction_with_unsuitable_kinetic_1(), test000065::test_import_reaction_with_unsuitable_kinetic_2(), test000064::test_import_rule_expression_and_hasOnlySubstanceUnits_1(), test000064::test_import_rule_expression_and_hasOnlySubstanceUnits_4(), test000064::test_import_rule_expression_and_hasOnlySubstanceUnits_6(), test000064::test_import_rule_expression_and_hasOnlySubstanceUnits_7(), test000075::test_import_time_dependent_function_definition(), SBMLImporter::variables2objects(), and CReaction::variables2objects(). Definition at line 216 of file CCopasiNode.h. Retrieve the child with given index of a node. If index is out of range NULL is returned. Definition at line 223 of file CCopasiNode.h. Definition at line 243 of file CCopasiNode.h. Retrieve the data of the Node. Reimplemented in CEvaluationNodeCall, and CEvaluationNodeObject. Definition at line 118 of file CCopasiNode.h. Referenced by CCellDesignerImporter::addDependency(), SBMLImporter::areEqualSubtrees(), CSBMLExporter::checkForUnsupportedFunctionCalls(), CEvaluationNodeNormalizer::collectIdenticalBranches(), CMathEventN::CTrigger::compile(), CMathEventN::CTrigger::compileVARIABLE(), CMathTrigger::copyBranch(), CMathContainer::copyBranch(), createCall(), SBMLImporter::createCReactionFromReaction(), createFraction(), CCellDesignerImporter::createSpeciesStyles(), CNormalTranslation::expandPowerExponents(), SBMLImporter::findCorrespondingFunction(), CSBMLExporter::findDirectlyUsedFunctions(), CCellDesignerImporter::findRootElementId(), CEvaluationNode::findTopMinus(), SBMLImporter::isConstantFlux(), SBMLImporter::isMassAction(), SBMLImporter::isMassActionExpression(), CEvaluationNodeNormalizer::normalizeCEvaluationNodeDelay(), CEvaluationNodeNormalizer::normalizeCEvaluationNodeFunction(), CEvaluationNodeNormalizer::normalizeCEvaluationNodeLogical(), CEvaluationNode::operator<(), CEvaluationNode::operator==(), replace_variable_names(), CSBMLExporter::replaceSpeciesReferences(), CEvaluationNodeOperator::simplifyNode(), test_compare_utilities::test_copasi_function_expansion(), test000091::test_delay_in_kinetic_law(), test000091::test_delay_in_kinetic_law_local_parameter(), test000065::test_import_reaction_with_unsuitable_kinetic_1(), test000065::test_import_reaction_with_unsuitable_kinetic_2(), test000075::test_import_time_dependent_function_definition(), test000078::test_l2v4_import_unordered_functions(), CReaction::variable2object(), SBMLImporter::variables2objects(), and CReaction::variables2objects(). Retrieve a pointer to the next node, which is either a child, a sibling, or an ancestor. The nodes are evaluated in that order and the first non NULL pointer is returned. If all evaluate to NULL, NULL will be returned. Definition at line 368 of file CCopasiNode.h. Referenced by CCellDesignerImporter::addDependency(), CCellDesignerImporter::createSpeciesStyles(), and CCellDesignerImporter::findRootElementId(). Definition at line 382 of file CCopasiNode.h. Retrieve a pointer to the next node, which is not a child node This is either a sibling or an ancestor. The nodes are evaluated in that order and the first non NULL pointer is returned. If all evaluate to NULL, NULL will be returned. Definition at line 396 of file CCopasiNode.h. Referenced by CCopasiNode< size_t >::getNext(). Definition at line 412 of file CCopasiNode.h. Definition at line 262 of file CCopasiNode.h. Referenced by CQBrowserPaneDM::add(), CQBrowserPaneDM::data(), CQBrowserPaneDM::load(), and CQBrowserPaneDM::rowCount(). Retrieve the parent of a Node. Definition at line 139 of file CCopasiNode.h. Referenced by convertToCEvaluationNode(), CFindDimensions::findDimension(), CQBrowserPaneDM::index(), CNormalTranslation::newCancel(), CNormalTranslation::newEvaluateNumbers(), CEvaluationNodeDepthFirstIterator::operator++(), CQBrowserPaneDM::parent(), CQBrowserPaneDM::remove(), and CEvaluationTree::setRoot(). Definition at line 145 of file CCopasiNode.h. Retrieve the sibling of a node. Definition at line 353 of file CCopasiNode.h. Referenced by CCellDesignerImporter::addDependency(), CCopasiNode< size_t >::addSibling(), SBMLImporter::areEqualSubtrees(), CSBMLExporter::checkForPiecewiseFunctions(), CSBMLExporter::checkForUnsupportedFunctionCalls(), CEvaluationNodeChoice::compile(), CEvaluationNodeOperator::compile(), CEvaluationNodeDelay::compile(), CEvaluationNodeLogical::compile(), CEvaluationNodeFunction::compile(), CMathTrigger::compileAND(), CMathTrigger::compileEQ(), CMathTrigger::compileFUNCTION(), CMathTrigger::compileGE(), CMathTrigger::compileGT(), CMathTrigger::compileLE(), CMathTrigger::compileLT(), CMathTrigger::compileNE(), CMathTrigger::compileOR(), CDerive::compileTree(), CMathTrigger::compileXOR(), createCall(), SBMLImporter::createCReactionFromReaction(), createLogical(), CEvaluationNodeOperator::createModuloTree(), SBMLImporter::divideByObject(), SBMLImporter::doMapping(), CNormalTranslation::elementaryElimination(), CNormalTranslation::elementaryEliminationDivide(), CNormalTranslation::elementaryEliminationFunction(), CNormalTranslation::elementaryEliminationMinus(), CNormalTranslation::elementaryEliminationModulus(), CNormalTranslation::elementaryEliminationMultiply(), CNormalTranslation::elementaryEliminationPlus(), CNormalTranslation::elementaryEliminationPower(), CNormalTranslation::eliminateDirectlyNestedFractions(), CNormalTranslation::eliminateNestedPowers(), CNormalTranslation::eliminatePowersOfFractions(), expand_function_call(), expand_function_calls(), CNormalTranslation::expandPowerBases(), CNormalTranslation::expandPowerExponents(), CNormalTranslation::expandPowerNodes(), CNormalTranslation::expandProducts(), CEvaluationNodeNormalizer::findChainNodes(), CSBMLExporter::findDirectlyUsedFunctions(), CSBMLExporter::findModelEntityDependencies(), CNormalTranslation::findNegativeNumbers(), CNormalTranslation::findSummands(), CCopasiNode< size_t >::getChild(), CCopasiNode< size_t >::getNumChildren(), CQBrowserPaneDM::CNode::getRow(), isLogical(), SBMLImporter::isMassAction(), SBMLImporter::isMassActionExpression(), SBMLImporter::isSimpleFunctionCall(), CQBrowserPaneDM::load(), CNormalTranslation::matchPowerBases(), CNormalTranslation::matchSummands(), CNormalTranslation::newCancel(), CNormalTranslation::newEvaluateNumbers(), CEvaluationNodeDepthFirstIterator::operator++(), CEvaluationNode::operator<(), CNormalTranslation::order(), CNormalTranslation::printPointers(), CEvaluationNode::printRecursively(), CNormalTranslation::product2fraction(), CQBrowserPaneDM::removeRows(), CCopasiNode< size_t >::removeSibling(), SBMLImporter::renameMassActionParameters(), replace_variable_names(), CSBMLExporter::replaceSpeciesReferences(), SBMLImporter::separateProductArguments(), SBMLImporter::setCorrectUsage(), CSBMLExporter::setFunctionSBMLIds(), CNormalTranslation::simplifyTree(), CEvaluationNode::splitBranch(), CNormalTranslation::splitProduct(), CNormalTranslation::splitSum(), CNormalTranslation::swapNegativeNumbers(), test000053::test1_bug1000(), test000053::test3_bug1000(), test000053::test5_bug1000(), test000093::test_bug1503_1(), test000093::test_bug1503_2(), test000052::test_bug988(), test000047::test_delay(), test000091::test_delay_in_kinetic_law(), test000091::test_delay_in_kinetic_law_local_parameter(), CEvaluationNodeDelay::toAST(), CEvaluationNodeChoice::toAST(), CEvaluationNodeCall::toAST(), CEvaluationNodeOperator::toAST(), CEvaluationNodeLogical::toAST(), CEvaluationNodeFunction::toAST(), and CReaction::variables2objects(). Definition at line 359 of file CCopasiNode.h. Remove a child from a node. Definition at line 181 of file CCopasiNode.h. Referenced by CMathEventN::CTrigger::compileNE(), convertToCEvaluationNode(), CNormalTranslation::elementaryElimination(), CNormalTranslation::eliminateDirectlyNestedFractions(), CNormalTranslation::eliminateNestedPowers(), CNormalTranslation::eliminatePowersOfFractions(), CNormalTranslation::expandPowerBases(), CODEExporter::exportSingleFunction(), CODEExporter::modifyTreeForMassAction(), CEvaluationNodeCall::removeChild(), and CNormalTranslation::swapNegativeNumbers(). 183 if (!pChild) return false; // Nothing to remove. Definition at line 316 of file CCopasiNode.h. 318 if (!pSibling) return false; // Nothing to remove. 338 return false; // We did not find a sibling. Set the child of a node. Definition at line 438 of file CCopasiNode.h. Set the data of the Node. Definition at line 128 of file CCopasiNode.h. Set the parent of a Node. Definition at line 427 of file CCopasiNode.h. Referenced by CCopasiNode< size_t >::addSibling(), CCopasiNode< size_t >::removeChild(), and CCopasiNode< size_t >::removeSibling(). Set the sibling of a node. Definition at line 448 of file CCopasiNode.h. Referenced by CCopasiNode< size_t >::addChild(), CCopasiNode< size_t >::addSibling(), CCopasiNode< size_t >::removeChild(), and CCopasiNode< size_t >::removeSibling(). Definition at line 65 of file CCopasiNode.h. Referenced by CCopasiNode< size_t >::getData(), operator<<(), and CCopasiNode< size_t >::setData(). A pointer to the first child of the node. Definition at line 54 of file CCopasiNode.h. Referenced by CCopasiNode< size_t >::addChild(), CCopasiNode< size_t >::deleteChildren(), CCopasiNode< size_t >::getChild(), CCopasiNode< size_t >::getNext(), CCopasiNode< size_t >::removeChild(), and CCopasiNode< size_t >::setChild(). A pointer to the parent of the node. Definition at line 49 of file CCopasiNode.h. Referenced by CCopasiNode< size_t >::addSibling(), CCopasiNode< size_t >::getNextNonChild(), CCopasiNode< size_t >::getParent(), CCopasiNode< size_t >::removeSibling(), CCopasiNode< size_t >::setParent(), and CCopasiNode< size_t >::~CCopasiNode(). A pointer to the first sibling of the node. Definition at line 59 of file CCopasiNode.h. Referenced by CCopasiNode< size_t >::addSibling(), CCopasiNode< size_t >::getNextNonChild(), CCopasiNode< size_t >::getSibling(), CCopasiNode< size_t >::removeSibling(), and CCopasiNode< size_t >::setSibling().